The main article for this topic can be found at Tomb Raider Comics. After the success of Tomb Raider (2013): A Survivor is Born, Dark Horse started releasing a new Comic Series: Tomb Raider (Dark Horse Comics) building on the story established in the game. A second series of comics was announced on 9 October 2015 and way released starting on 17 February 2016. Countless characters were introduced for the Tomb Raider comics, all of which can be found in the Top Cow Comic Characters article. Only a few of those played an important role and occurred more than once. This one-shot game prequel to Tomb Raider (2013) was published 5 March 2013. The series Lara Croft and the Frozen Omen follows the storyline established in Lara Croft and the Guardian of Light, Lara Croft and the Temple of Osiris and Lara Croft: Relic Run. The first issue was published on 7 October 2015. The second Tomb Raider Series by Dark Horse has been published starting in February 2016. Announced in July 2017 this third series by Dark Horse will be published starting November 2017. The series continues Lara's search for answers to her father's death after the events in Rise of the Tomb Raider. The first comic published by Top Cow was a crossover between Tomb Raider and their well-established Witchblade series. This issue came out in December 1997. Following the release of the first crossover, Top Cow published a second crossover a year later, in December 1998. Tomb Raider: The Series Vol. 1 ran from December 1999 to March 2005 and consists of 50 issues. A one-shot Tomb Raider comic from 2000. A single comic issue from 2000 containing favourite images from the Top Cow comics. The 12 issue miniseries Journeys ran from January 2001 to May 2003. 2001 saw the release of another crossover, with this Tomb Raider / The Darkness Special, republished in April 2005 in The Darkness and Tomb Raider Vol. 1, Issue 1. In 2001 a preview to the ambitious Tomb Raider The Greatest Treasure of All was published. 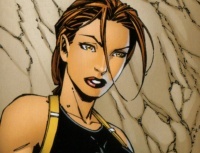 In early 2002 Lara Croft appeared in three issues of the Fathom comic series. A one-shot Tomb Raider comic from 2003, republished in April 2005 in Witchblade and Tomb Raider Vol. 1, Issue 1. Tomb Raider: Ephiphany is a one-shot comic published in August 2003. A one-shot Tomb Raider comic from January 2004. Tomb Raider: Takeover is a one-shot comic published in January 2004. Tomb Raider: Arabian Nights is a one-shot comic published in August 2004. Monster War is a four-part comic crossover between The Magdalena, Dracula, Tomb Raider, The Wolf-Men, Witchblade, Frankenstein, The Darkness and Mr. Hyde. The Tomb Raider / Witchblade / Magdalena / Vampirella crossover was published in August 2005. October 2005 finally saw the release of the full version of Tomb Raider: The Greatest Treasure of All. A single comic issue from 2006 containing all Covers of the Top Cow Tomb Raider comics to date. The second volume was planned to launch in 2007, after the release of Tomb Raider Legend, but it never came. This page was last modified on 4 November 2017, at 19:35.